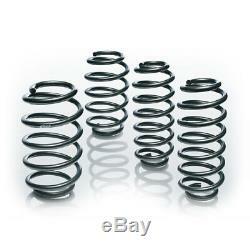 Eibach Pro-Kit Lowering Springs Kit. For detail vehicle specification see the corresponding table below. 4 springs for front and rear axles. The product images shown are for illustration purposes only and may not be an exact representation of the product. Slide the table for more details. 01.2004 - 02.2015. 09.2002 - 02.2015. 01.2007 - 02.2015. 05.2009 - 02.2015. 2.0 t Bio Power. 06.2007 - 02.2015. 01.2011 - 02.2015. 09.2004 - 02.2015. 12.2007 - 02.2015. Additional information for 9-3 (YS3F). Pro-Kit lowers your car´s center of gravity, reducing squat during acceleration, body roll in corners and excessive nose-dive under braking. When combined with Plus-1 or Plus-2 wheels and tires, the Eibach Pro-Kit is the finishing touch to a winning recipe for performance. Pro-Kit also reduces excessive fender-well clearance, making your car look just as hot as it performs. By using our proprietary, progressive spring design, Pro-Kit provides the ultimate balance to take your passion for driving to a whole new level. Product is unused, original and fully worthwhile. Picture for illustration purposes only - actual kit may differ from shown. Feel free to ask us. You can send a message. We offer you our 10 years of experience and 24h customer service. We have been trading in the Motorsport industry since 2006. Rallyshop supplies racewear, parts and accessories to motorsport competitors, teams, enthusiasts and spectators in the whole world. We stock hundreds of brands including Sparco, OMP, Stilo, Eibach, B2, Ferodo, Peltor, Setrab, Schroth, VDO, Goodridge, KW, Simpson, Sabelt, AP Racing, H&R, Mocal, Powersprint, Spal, Simoni Racing, Tilton, Momo, Bilstein, Sachs, Willwood, ATL and QMS. We offer for example boots. Our race accessory shop offer a friendly, knowledgeable customer service both on site and online. You only have to check our feedback score to see we\'re the most reliable sellers in Race, Rally and Karting. The item "Eibach Pro-Kit Lowering Springs E10-78-003-01-22 Saab 9-3" is in sale since Tuesday, November 3, 2015.